Ready to get your groove on? 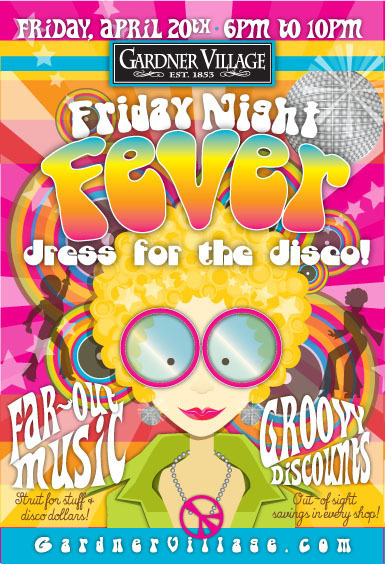 Come celebrate Friday Night Fever with Gardner Village—or as we call ourselves, the “Village People.” Put on some far-out disco clothes and dance on over for some disco ball deals and disco music on our paths from 6 to 10 pm on Friday, April 20th. We might even let you strut your stuff for disco dollars and prizes. It’ll be fab, far out, groovy and everything in between. Can you dig it?! While you're here, strut over to the Cottage Retreat Spa & Salon's pad and get the skinny on their mini services. You'll like their chill pedicures, to-the-max massages, foxy haircuts and styles, funky manicures and in-your-face eyebrow shaping. These groovy services start at just $15. Right on!